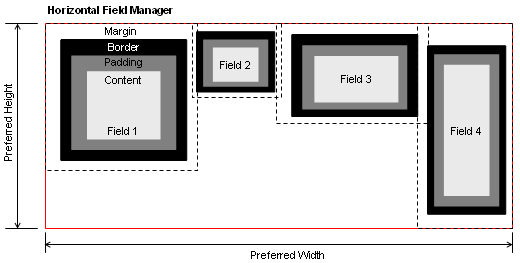 A manager that lays out fields along a single, horizontal row. A horizontal field manager lays out fields from left to right on a single row. The layout direction can be changed to locale-aware leading to trailing by specifying the HorizontalFieldManager.LOCALE_AWARE_LAYOUT style bit in the constructor. The layout direction can also be controlled by setting the style of the HorizontalFieldManager to include Field.RIGHT_TO_LEFT or Field.LEFT_TO_RIGHT in the constructor. This will override any locale aware settings. You can build this manager with Manager.HORIZONTAL_SCROLL to accommodate collections of fields wider than the manager's visible frame; you can build this manager with Manager.VERTICAL_SCROLL to accommodate fields taller than the manager's visible frame. Used to specify locale aware layout. Constructs a new horizontal field manager. Constructs a new horizontal field manager with provided style(s). Retrieves the closest field under a particular point. This method builds a new horizontal field manager with no style. style - Styles recognized by this manager include Manager.HORIZONTAL_SCROLL, Manager.VERTICAL_SCROLL Field.LEFT_TO_RIGHT and Field.RIGHT_TO_LEFT. This method returns the width (in pixels) required to lay out the manager�s contents. It includes the preferred widths for the controlled fields, as well as spacing between these fields. Spacing between neighboring fields is defined by the largest of each field�s margins. Horizontal space preferred by this manager. This method returns the height (in pixels) required to lay out the manager�s contents. The contents height is defined by the highest of controlled fields and its margins. Vertical space preferred by this manager. This method is called by the framework during a track-ball focus move operation. HorizontalFieldManager will move focus out of the manager in the event of AXIS_VERTICAL movement. HorizontalFieldManager performs a binary search for the x coordinate passed in. No checks are made for the vertical value. Index of the closest field to (x,y); -1 if no fields exist.